Step after step: taking your time to stop and watch the beauty that will surrond you. 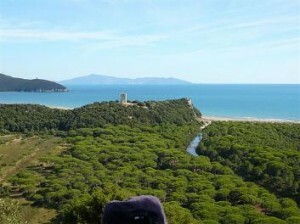 Come and visit the Tuscan Coast and Arcipelago for the “Tuscany Walking Festival“, that will take place from 16 April to 13 November 2011 in a real great atmosphere, located in six Natural Parks in the Region of Tuscany. Make a very slow movement around, which draws “an ideal path on a non existing map”, and many events, such as photography exhibits, birdwatching courses, and restaurant discounts close to the walking regions. The nature protected by Parks open to the many souls who will get there, full of conviviality: the Walking Festival means 6 Natural Parks in hundreds of events, as a result of a feast ideally capable of bridging the sea that divides the Coast from the Islands!! Tuscany offers its beautiful “costa” and thousands of hectares of nature preserves and woodlands. Numerous opportunities for hikers and trekkers! The Tuscany Walking Festival goes on roughly between the first days of spring until the end of fall: i this periodo you can discover extraordinary sea and lands and you will integrate both the desire of knowledge and the necessity of sharing ones emotions and experiences. The festival includes the Maremma, the Monti Livornesi and the Tuscan Archipelago. Follow the program excursions of the Walking Festival Parks!!! This entry was posted on Wednesday, June 8th, 2011 at 3:00 pm	and is filed under Events in Italy. You can follow any responses to this entry through the RSS 2.0 feed. You can leave a response, or trackback from your own site. « Classical tiramisù: craving for the right one!